over great distances based on superior knapping properties from one region to another. Medieval history tells of contests utilizing swords and lances to prove the skills of a knight and the talent of the village smith. Pocket knife traders have argued the virtues of one brand over another on courthouse squares for decades. Savvy collectors have been comparing smooth shaven arms to attest to the keenness of their favorite makers’ blades at knife shows since the early 1970’s when The Knife makers’ Guild first got its start. The legendary Bill Moran, co-founder of the American Blade smith Society, may have been the originator of cutting competitions as we know them today. Mr. Moran kept a brush pile behind his shop where he would test his knives cutting tree limbs. He continued this practice even after his knives were selling for thousands of dollars. The way a knife cut was vitally important to him — an importance fundamental to the advancement criteria of American Blade smith Society, assuring that function always be inherent to the art of the forged blade. 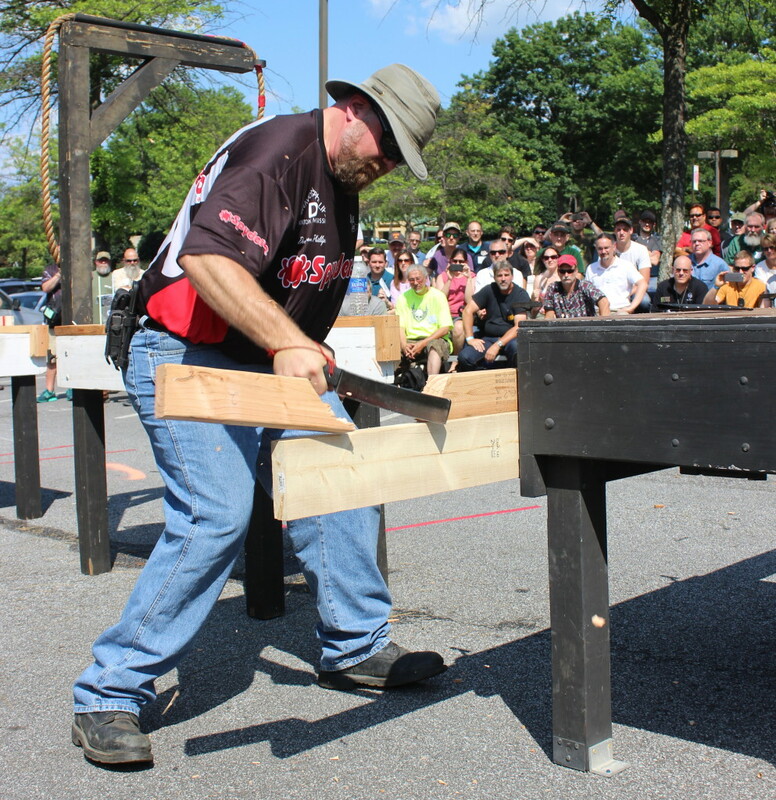 With the ABS requirements of cutting a 1″ free-hanging rope then chopping through 2X4’s as part of the tests for Journeyman and Master Smith rating, two components of modern day cutting competitions were in place. 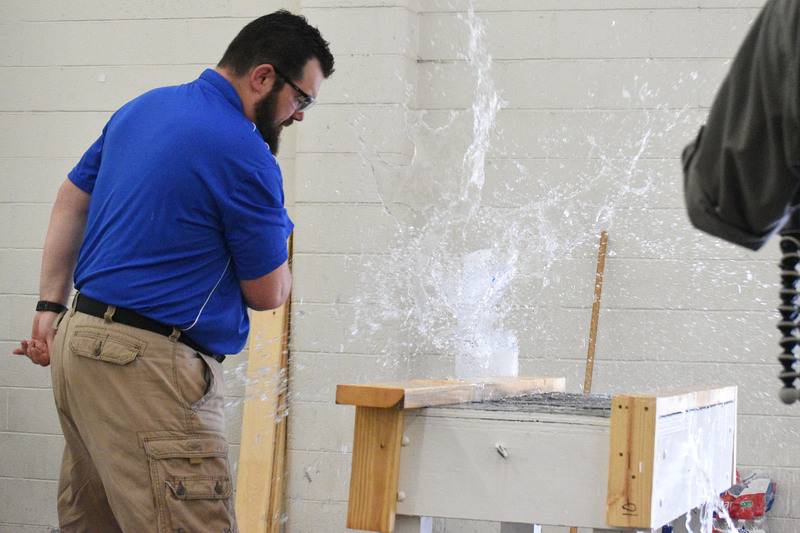 Beginning in the 1980’s, cutting demonstrations were held in meeting rooms at the Blade Show. 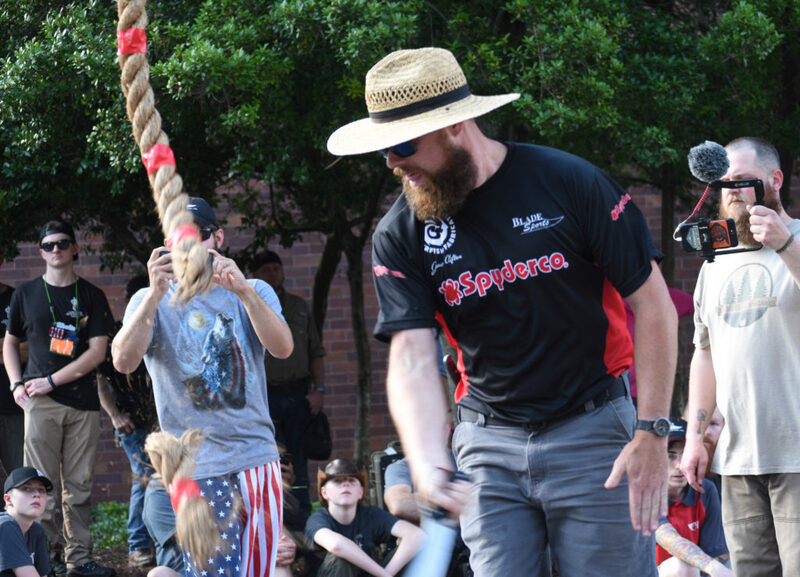 The Oregon Knife Collectors Association Show added a rope cutting competition to their event about the same time; ropes were added one at a time until a winner was declared by cutting more ropes with a single swipe than anyone else. 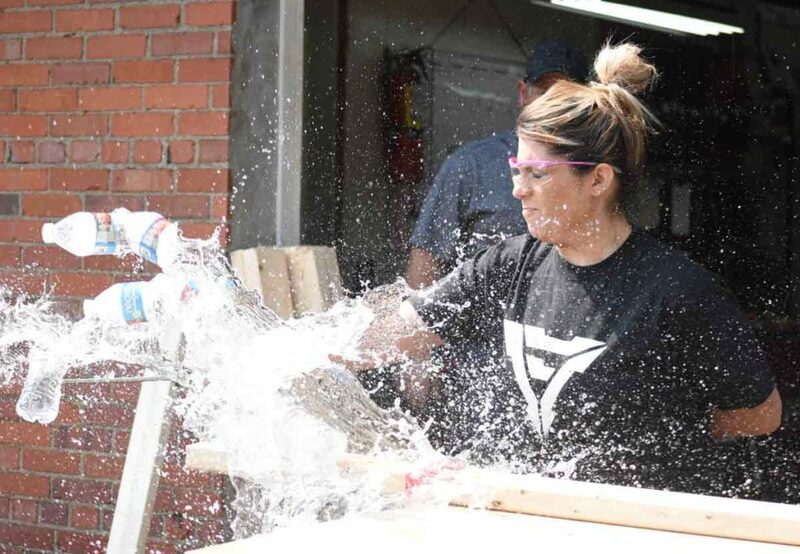 The magic of contemporary cutting competitions was born in the 1990’s at an American Blade smith Society Hammer-in; a contest was proposed to pit participants against one another in a series of cutting feats. The contest was held and a victor declared. 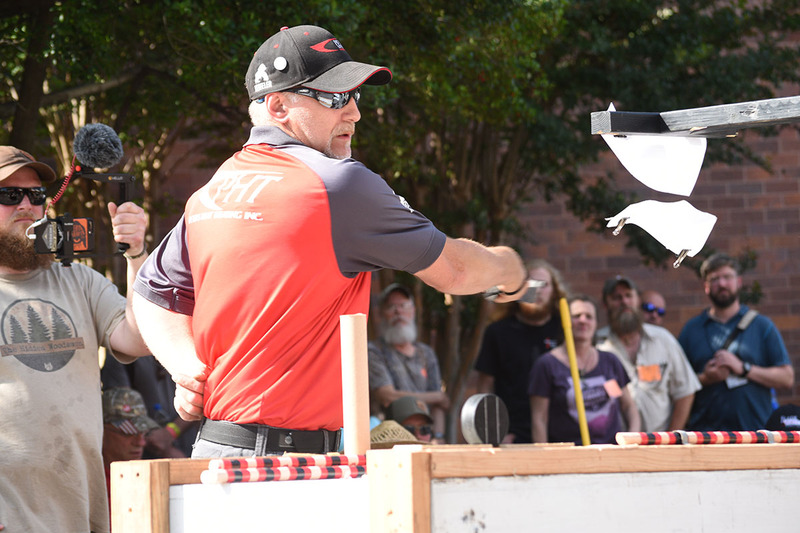 The broad appeal of cutting competitions was obvious when Blade smith Jim Crowell was featured on the cover of the Wall Street Journal after winning one of these informal events. Soon cutting competitions became a standard feature of the ABS Hammer-ins. The number of competitors and spectators grew rapidly; sparking an international following for the events. 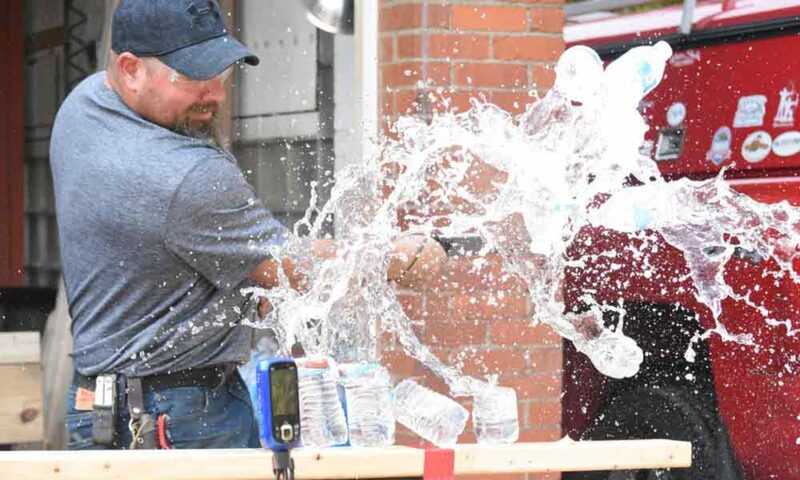 Eventually, points were awarded at ABS sponsored cuts, with the top qualifiers vying for the title of World Cutting Competition Champion at the annual Blade Show and International Cutlery Fair. Past winners include Reggie Barker and Jim Crowell. One drawback to these organized competitions was that a person had to be an ABS member, having forged his or her own knife, to be eligible to participate. The Knifemakers’ Guild added a cutting contest to its show in 2004, opening competition to both forged and stock-removal handmade blades. All participants were required to make their own knives and complete approved Cutting/Safety Seminars. Spectators enticed by the excitement took classes and began making their own knives for a chance to compete. 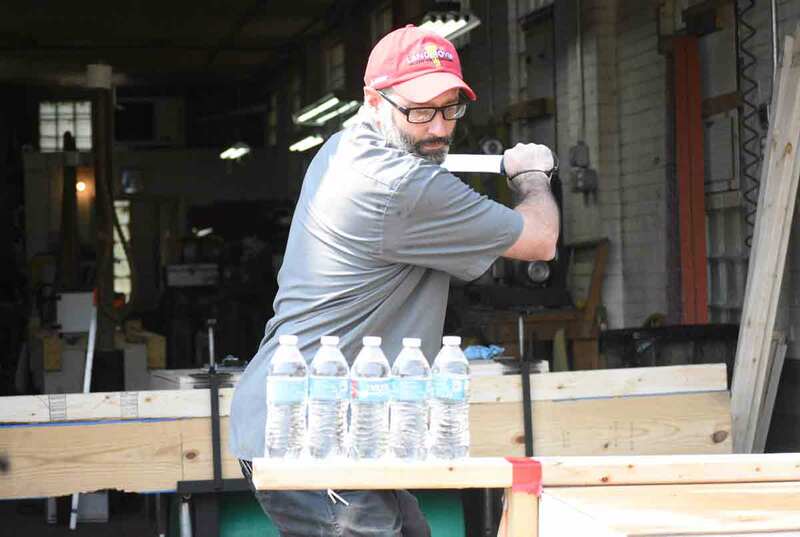 The addictiveness of competitive cutting prompted longtime stock-removal makers to join American Blade smith Society and learn to forge, just so they could take part in ABS events. Allure of competition continued to grow. In 2005 a few knife cutting enthusiasts began discussing a worldwide competition open to all types of knives, including factory made pieces. They visualized a sporting event open to a diverse group of competitors. By demonstrating safe and practical use in public forums, they envisioned a positive image for the cutlery industry — much needed to counter the rising tide of anti-knife sentiment in some circles. BladeSports International, Inc. memberships are available to competitors, sponsors and fans of competitive cutting — offering awards, demonstrations, schools and workshops. Competition is open, not just to knife makers, but also to anyone fulfilling certification requirements. The BladeSports International, Inc. events will be held at knife shows and retail venues throughout the country, culminating with an international championship each year. A knife is a tool. It is natural that one knife will cut better than the other and that one cutter may outperform another. The correct combination of both creates a winner — many will strive to attain that title — and many others will enjoy watching their pursuit. I started making knives in 2004. I went to my first BladeSports school at Warren Osborne’s house in December of 2006. So in a sense, my knifemaking has grown up with BladeSports. A coworker brought home a flyer he picked up while on vacation in Branson, MO in the summer of 2006. He happened to see BladeSports doing a competition and brought home a signed 2X4 and a flyer, handed both to me and said “Go”. I built my first two comp knives and went to the school, both of those knives were quickly replaced. I learned a lot and learned it fast by competing. I still have the signed 2X4 in my shop by the way. It has been a whirlwind since that day. I won the competition at Warren’s school a year later in 2007 with my first CPM-M4 comp knife, and my first knife with a tapered tang. Since then I have won four National Championships and I currently hold the water bottle record at twenty eight bottles in a single file row. I’ve been involved and supplying knife steels to the knife making community for over 30 years. Original member of BladeSports International. Hi I’m Jessi Elias. I am a Digital & Marketing Director in my real big girl job but for a passion I am involved with the knife community. I am the first women’s BladeSports National Champion and the first lady to compete at the National & World’s level. I have been competing in BladeSports for 4 years now. I was a contestant on the History Channel’s hit show “Knife or Death”. I serve as a member of the BladeSports Board of Directors. If you have any questions about getting involved with this amazing sport please contact me or one of the board members. We will get you all set up! My name is Brad Stallsmith. 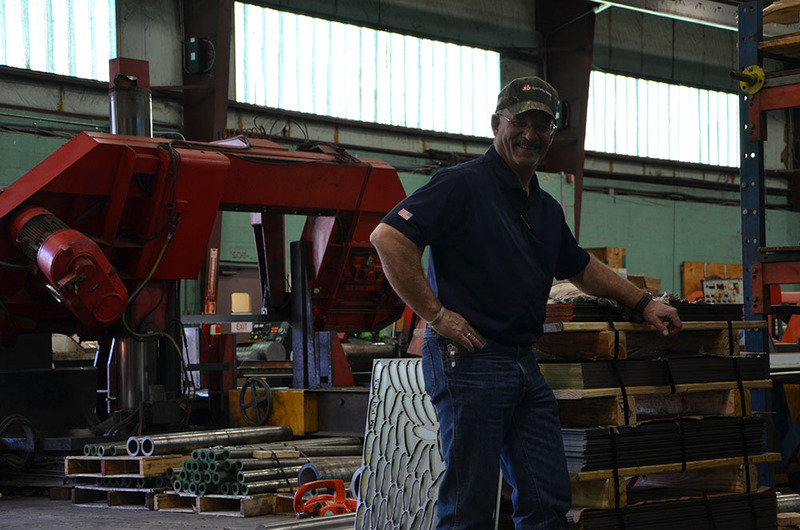 I have been a working at Peters’ Heat Treating since 1981 and have been specializing in knives as the Blade Division Manager for the past 15 years. I have been involved in Bladesports since 2007 and have trained as an instructor and an official for events for the past 10 years. I live with my family in NW Pennsylvania where I was born and raised. I married my lovely wife in 1986. We have 2 children and 2 grandchildren. Hello, I am James Clifton. I’m 35 and live just outside of Nashville TN. I am a Bladesports instructor and certified knife maker. I am a part time knifemaker. I won the Bladesports world title in 2017. I’ve been a knife enthusiast my whole life and I’ve been a hobbyist knife maker for about 10 years. I joined Bladesports with my friend and mentor LT Wright of LT Wright hand crafted knives. It seemed cool, like drag racing with a blade. A few years in I have met some amazing people through the sport. Something I hadn’t foreseen was the great sharing of information in construction as well as technique. The other competitors really want you to do well and most of the time will help you in any way they can. I’ve learned a tremendous amount about the finer points of hard use knife construction and geometry. It also affords me the opportunity to trial materials and designs I might not pursue otherwise. If you’re on the fence about it come out and give it a try. It really is a tremendously rewarding pursuit. Much more so than I would have believed from the outside looking in. I am a Knife maker at LTWK and a Bladesports competitor. I serve the Board as the Secretary. I have been on the Board for two years now. Come join us in this exciting sport. Always use care when handling knives and never attempt competitive cutting practice without proper training and supervision.